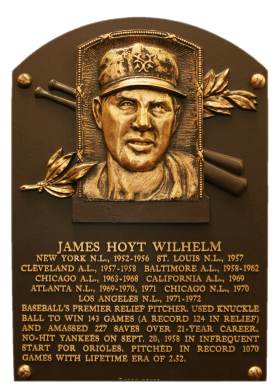 Hoyt Wilhelm was the first pitcher elected to the Hall solely on his merits as a reliever. A knuckleballer, he toiled for nine teams, pitching in a record 1,070 games and winning 124 in relief. He started only 52 games in his 21-year career, compiling 227 saves and a 2.52 ERA. "Snacks" pitched five consecutive seasons (1964 to 1968) with an ERA under 2.00. 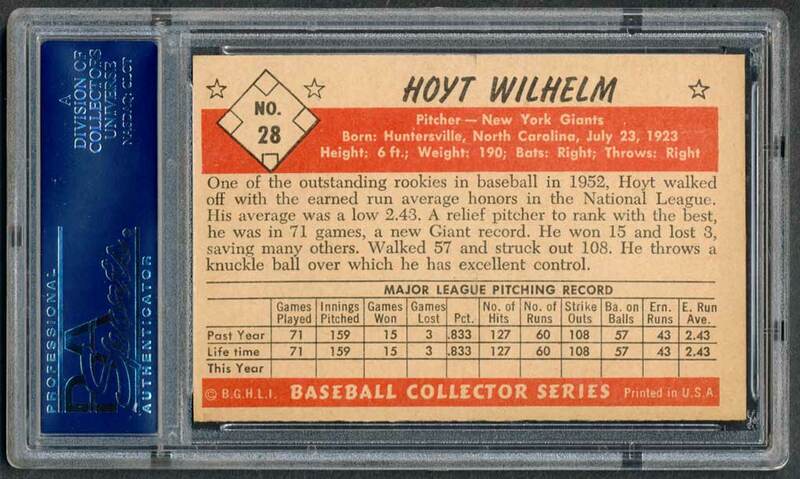 In his very first major league at bat, Wilhelm hit what would be the only homer of his entire career. Comments: I picked up a 1969 Topps PSA 9 from seller Bob Krawetz (theninthinning) on eBay in January, 2000. Since I also owned a '69 Lopez, I swapped the card out for a new type card - a 1953 B&W Bowman PSA 6 with an eBay win in April, 2007. I upgraded to this PSA 8 with another eBay win in March, 2012 from Just Collect, Inc. 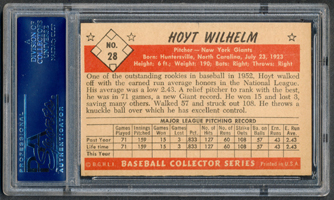 Description: The 1953 Bowman black-and-white set is similar in all respects to the 1953 Bowman color cards, except that it lacks color. 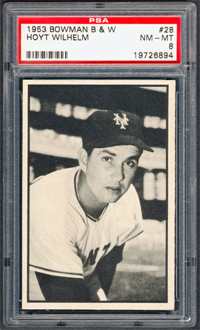 Purportedly, high costs in producing the color series forced Bowman to issue the set in black and white. Sixty-four cards, which measure 2-1/2" X 3-3/4", comprise the set.